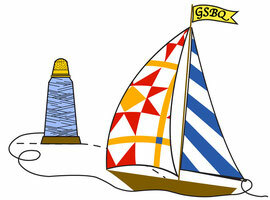 At its May 2018 meeting, the members of the Guild celebrated its 35th Anniversary. 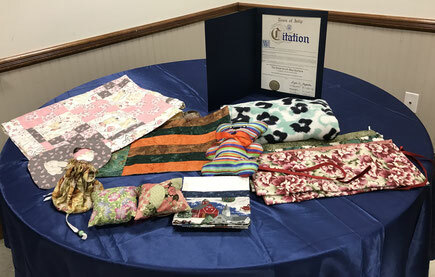 Each member enjoyed light appetizers and desserts, and each received a free bag of fabric! 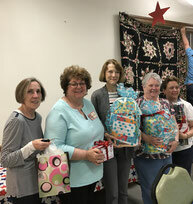 Raffles were also awarded, which included irons, light boxes, gift certificates from our local quilt shops, notions, patterns batting and more! A citation from the Town of Islip was given to commemorate the event. 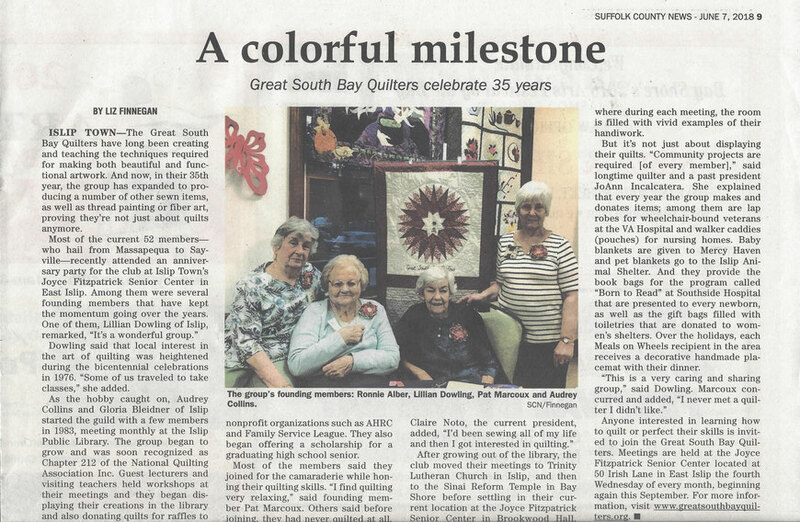 See below for the article written by Liz Finnegan which appeared in the Islip Bulletin's May 31, 2018 edition and the Suffolk County News' June 7, 2018 edition. Lil, one of the four active founding members. Rose and Cindy were happy winners! Sandie, SaraJean, Stephanie and Dottie won some great raffles!! More happy winners: Dawn, Sandie, Susanne, Donna and Yasmina! 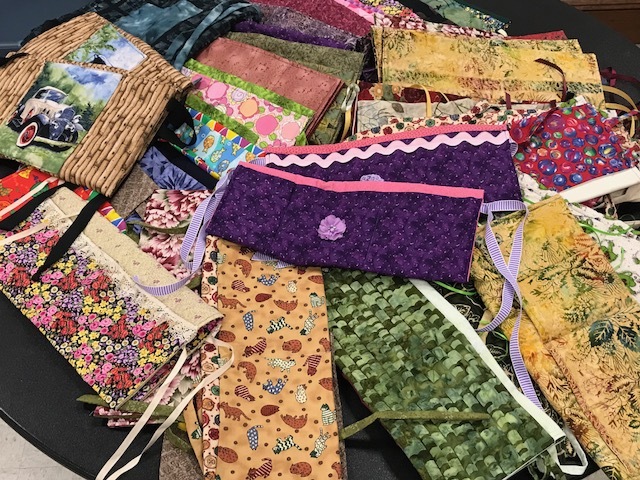 Samples of the many charity projects members have made. Citation from the Town of Islip is at top right. 2018 President Claire Noto and Website Manager Joan Dlouhy went with fellow guild member MaryEllen Ransom to deliver 29 dog beds to the Town of Islip Animal shelter. Claire and Joan are pictured here with Magee, one of the many dogs who will enjoy using the dog beds made by GSBQ members. Pictured below are some of the many walker/wheelchair caddies that were donated to Maria Regina Residence in Brentwood. These are attached to the residents' walkers or wheelchairs to carry essentials and treats! 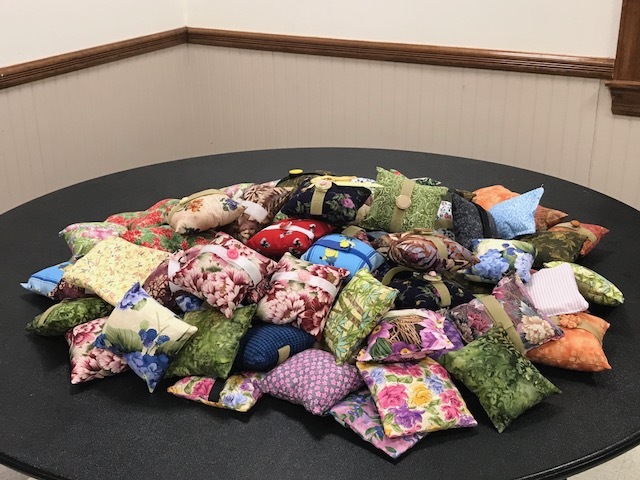 Guild members made 97 port pillows to be donated to cancer patients undergoing chemotherapy. The pillows are placed between the patient's port and seat belt for added comfort while driving/riding in a car.